The body structure overall should be one of great strength with good thickness of bone, with males being solid and compact with good muscle tone. Nice long bodies on the females are preferred as a rule due to being better whelpers than short bodied females. A nice level topline is preferred with tail cartridge straight off the back, docked or not. Moderate turn of stifle and hock angulations. Chest area should be broad with the brisket well let down. Front should be straight with good shoulder placement. Body coat preferred short and smooth, not thick or rough. The head structure of an Aussie Bulldog is one of its main attributes, being very strong and square in appearance, having good depth and width of muzzle with a pronounced stop between the eyes and have 1/3 folds of wrinkle across the nose. Eye placement should be wide apart, being large and clean in appearance. Mouth to be up to 1/4 inch undershot but breeding toward a near level bite preferred. Teeth should be of good size and well placed within the mouth. Jaw structure preferred wide and square top and bottom. The Aussie Bulldog comes in a variation of wonderful colors, including shades of fawn, apricot, orange, red, mahogany, white and at least 5 shades of brindle including red brindle, fawn brindle, black brindle, mahogany brindle and silver brindle. Aussies also come in pied coloring with pied being one color more dominant than the other, and an arrangement of patches on the body that is quite appealing. 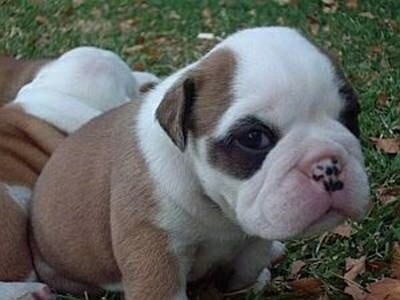 The Australian Bulldog is a medium sized dog that loves being part of a family. 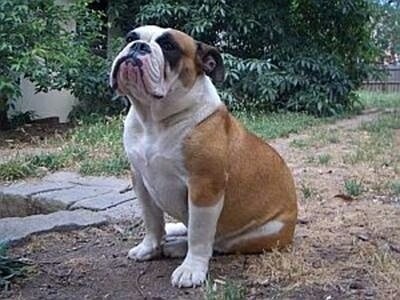 The Aussie Bulldog is intelligent, loving and loyal with a sound temperament. Good with children and fun-loving, this breed is pretty easygoing. It will enjoy playing with a ball or Frisbee and loves to play or swim in water. It is a good watch dog but not a guard dog, though its appearance can be a deterrent. Given the alertness of this breed, the Aussie Bulldog does have the ability to be a dependable watch dog at a mature age. With its intelligence and loyalty it is a very easy dog to teach at home, but obedience training is recommended (as with any breed of dog). 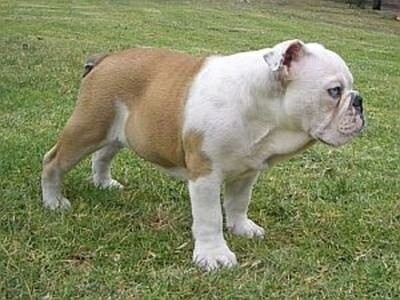 The Aussie Bulldog has stamina and its personality is one everyone could get attached to. This breed craves leadership from its owners. Like all dogs, they need a firm, but calm, confident and consistent pack leader and daily mental and physical exercise to avoid any behavior issues. Although the best has been done to eliminate health problems within this breed, this does not mean that they are faultless, but all effort is put in to breed Aussie Bulldogs of good health, sound structure and good nature. Aussie Bulldogs are not recommended for apartment life, but can live in the smaller space if sufficiently exercised. This breed is an indoor dog, and should not be left outside all day in a kennel. Bulldogs do best in temperate climates as the breed can chill easily in cold weather and have trouble cooling off in very hot weather. Aussie Bulldogs need plenty of exercise which includes long daily walks. They like to go swimming in summer and lie in the sun during the winter months. 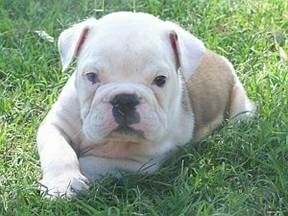 The Aussie Bulldog was given its name by Noel and Tina Green. It was foundered from two breeding programs (N&T Green and Pip Nobes) with previous years of breeding dogs of Bulldog type that were designed to be a functional Bulldog, co-operating and coordinating together after previous Green lines and Nobes lines (Pip Nobes). This type of dog had the strength, endurance and size to do the job that was set out for it. 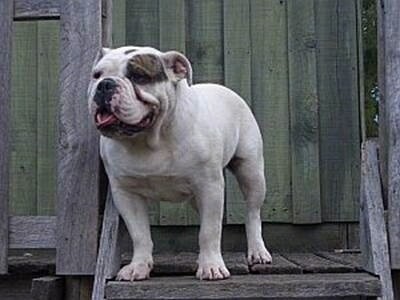 The original breeders made personality and health in a dog their top priorities, along with keeping a unique Bulldog look. 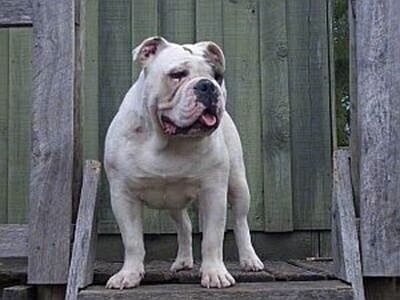 The Aussie Bulldog is a recognized breed within the eye of the general public, but they are not yet registered with the ANKC as a pedigreed breed. 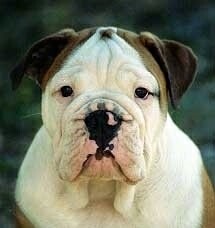 All lines of Aussie Bulldogs should come with a breed certificate for the documentation of their ancestry. These certificates are issued by the United Aussie Bulldog Association by contacting Tina Green, Pip Nobes and Louise Cauchi. The public first heard about this breed back in 1998 as a result of Keith Nobes asking Pip to write to Burkes Back Yard and inform them of their combined breeding program of The Aussie Bulldog. On their way home from Western Australia, driving from Perth to Toowoomba they (Noel and Tina) visited Joe and Louise Cauchi in Sydney's western suburbs and viewed 2 litters of pups that were of Aussie Bulldog type, making them approximately 2 weeks old when the program aired on Burkes Back Yard. The interest created by this program was absolutely hundreds and hundreds of enquiries made by mail, email and phone to Pip Nobes and N&T Green, all looking to purchase a puppy. Both breeding programs were in the early stages, and originally from Greens Lines and Nobes Lines; this was very promptly followed by Cauchi's lines. Since then they have continued to increase the Aussie Bulldog population with approximately 40 or 50 more enthusiastic breeders joining together all three lines of dogs. Nobes lines and Greens lines were developed heavily based on British Bulldog, Bullmastiff, Boxer and a small percentage of Staffy, closely followed in the months to come by the introduction of Joe and Louise Cauchi's dogs based mainly on JD Johnson Line American Bulldogs, which do not have any connection in physical type or temperament to the American Pitbull or the Scott line American Bulldog. 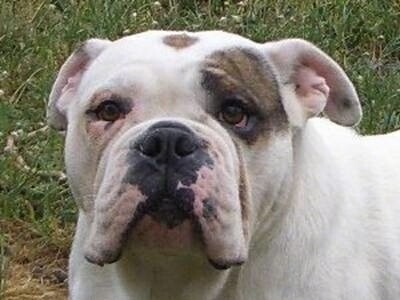 Johnson line American Bulldogs are similar in height and head type to the Boxer and Bullmastiff. 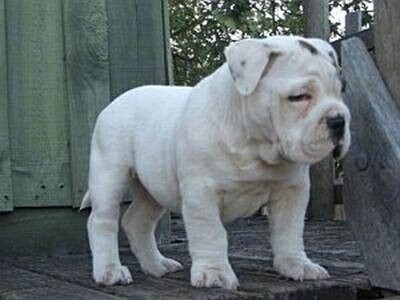 Their breeding stock now has 5 generations of Aussie Bulldog to Aussie Bulldog in total. The consistency with the Aussie Bulldog is better than a lot of pedigreed breeds in proving this with every planned litter. 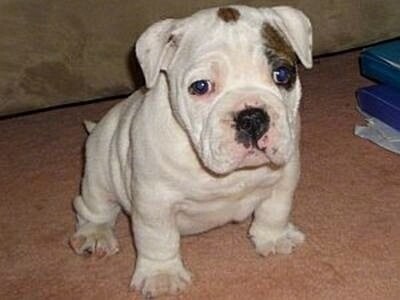 "Paris as a 12 and a half-week-old puppy; she is an Australian Bulldog . She is a cheeky, playful girl who sometimes forgets what the newspaper is for!!! She likes cheese, pink lady apples, walks, sleeps and pats. She doesn't necessarily enjoy the vacuum cleaner, things with wheels or loud noises. Her good habits are that she can already sit, stay, and go to bed. She loves walks with the family and playing with us kids." Magri’s Lexy of Beccam Aussie Bulldogs as an 8-week-old puppy; she is a very solid young female even at a young age. 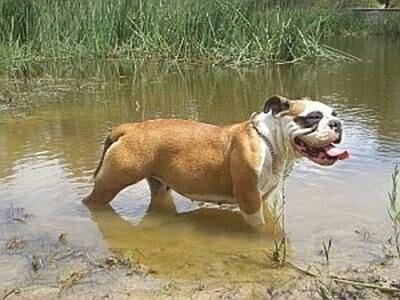 Daisy of Beccam at 14 months old; Aussie Bulldogs love the water and can be quite active. Paris the Australian Bulldog residing in Australia—"She is a very beautiful girl. 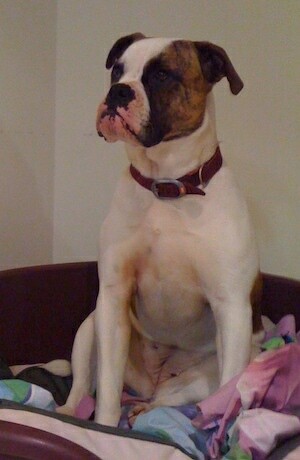 She can be destructive and naughty but we trained her right and now she is very well-behaved and an amazing guard dog. We love her very much and she is great in this environment. She copes very well with our small backyard and loves her food!"